If you enlarge the image you can see quite clearly the typed name of the purchaser (and this is helpfully given in the caption). Palladion Antike Kunst has been linked to objects returned to Italy from the J. Paul Getty Museum and Boston's Museum of Fine Arts. The Getty is also reported to have purchased the "Getty kouros" from Becchina. Palladion Antike Kunst appears to have supplied objects now in Amsterdam's Allard Pierson Museum, the Miho Museum in Japan, and Madrid's National Archaeological Museum. Press reports suggest that Italy's Operation Andromeda demonstrated links between Becchina and a certain Japanese dealer. When will the Michael C. Carlos Museum resolve this issue? 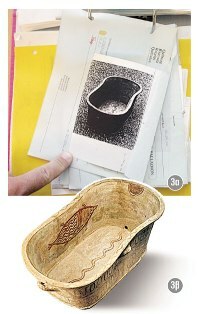 When will they publish the full collecting histories for the three pieces? And remember, "The Museum will not knowingly acquire any object which has been illegally exported from its country of origin".